This Home Page provides a summary of the water resource reconciliation strategy for the Western Cape Water Supply System; how needs can be met to 2040 and beyond as water requirements continue to grow. More detail is provided under the page tabs above. The Western Cape Water Supply System (WCWSS) serves more than 3.2 million people, providing water to the City of Cape Town (CCT) and certain Overberg, Boland, West Coast and Swartland towns, as well as to irrigators along the Berg, Eerste and Riviersonderend rivers. This area generates approximately 14% of the national GDP. Key sources of water are the Berg and Breede Rivers and their tributaries - now all heavily utilised. Additional coastal rivers include the Eerste, Steenbras and Palmiet rivers and there is some groundwater, with the Table Mountain Group Aquifer potentially very significant. Proximity to the sea allows for desalination. Climate Change predictions are for a decline in rainfall for this region. Along with increasing temperatures and hence evaporation, the implications for run-off and long-term assurance of supply are potentially serious. For more detail please refer to the Steering Committee, Stakeholder Engagement, and Reports & Documents pages. The Western Cape Water Supply System Reconciliation Strategy was completed in 2007. The latest complete update of the scenario planning was done in October 2014, with further data and preliminary analysis carried out in April 2015. The current situation is discussed below. The strategy objectives are to reconcile future water requirements with supply for a 25-year planning horizon, and to provide a framework for decision-making with regard both to securing supply and managing demand. The strategy is updated regularly to keep within this time horizon, adapting to the changing situation and incorporating new information as this becomes available. For this a Strategy Steering Committee has been established. The WCWSS Strategy Steering Committee replaced the original Study Steering Committee on completion of the strategy in 2007. This Committee has representatives from all provincial government departments and other key stakeholders involved in water resources management, including organised agriculture, the Breede-Gouritz CMA, the City of Cape Town, relevant District and Local Municipalities, and the DWS regional and national offices. implementation of the strategy by all role-players, is responsible for ensuring that the Strategy is updated regularly, and is responsible for keeping institutions and the public informed. A number of different water requirement scenarios have been considered. The long lead time for water provision requires that a careful approach be taken in ensuring a matching supply. The accompanying graph shows the current system yield (582 million m3/a), actual and adjusted water use (i.e. 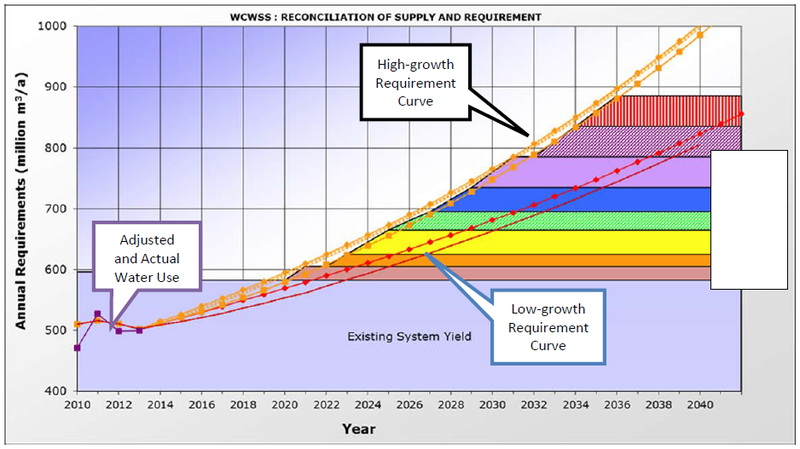 capped agricultural use), and the expected growth in water requirements until 2040, given the high growth and low growth scenarios, based on the updated WDM Strategy. The system is currently in surplus due to the completion of the Berg River Dam (2006/07). Without the successful implementation of the WC/WDM measures as set out in the City’s WDM Strategy, and with high growth in water requirements, this surplus would only be adequate to 2017. However, the City has invested heavily in implementing WC/WDM measures and it is already reaping the results: with the lowered growth in water requirements being experienced, this date can be stretched to at least 2020 before the next augmentation scheme needs to come on line. This has critical implications for the implementation of the capital-intensive new augmentation scheme. For more detail consult the latest Status or Progress Report and the main Reconciliation Strategy Report (see Reports & Documents). The City of Cape Town is implementing a 10-year water conservation and water demand management strategy (see Reports & Documents). The CCT struggled to achieve the initial targets due to budgetary and resource constraints, but by 2011 the increase in actual water use had slowed down significantly, and has been negative for three consecutive years since 2012. This suggests that either growth is well below the high level anticipated and/or that Water Conservation and Water Demand Management has been very effective. The CCT has updated and adjusted its WC/WDM targets, which have been incorporated into the Reconciliation Strategy. The current planning scenario is that WC/WDM will achieve a further reduction in use so that the system only goes into deficit between 2020 and 2022. By this time the next augmentation option will have to be in place. Agricultural water use is capped by its allocation. WC/WDM has been prioritised by this sector. Water losses have been minimised so as to optimise agricultural production within the limitations of the allocation. Surface water schemes: The Department undertook feasibility studies on various surface water options, with the augmentation of Voëlvlei Dam (Phase 1) the most favourable. The Department is currently addressing the EIA so that this scheme can be implementation-ready should it be selected. Desalination of seawater: A feasibility study was commissioned by the CCT in July 2012 and is close to completion. Re-use of water: A feasibility study was commissioned by the CCT in May 2014 and is in progress. Table Mountain Group Aquifer: The CCT is committed to proceed with the investigation of the TMG Aquifer. The next phase of the study is scheduled to run over three years. It is envisaged that a consultant will be appointed in due course. The results of the current feasibility studies will assist the Strategy Steering Committee in making a recommendation on which of these priority options to implement in order to provide more water by 2020. The SSC convenes again in October 2015 and would then need to make a recommendation regarding the next intervention. The next augmentation option to be implemented will meet water requirements for a limited time only; this will have to be followed in short order by other interventions. Options are listed below. The implementation of the Voëlvlei augmentation option, or alternatively the development of the TMG Aquifer, introduction of desalination or commencement of water re-use, will provide a little breathing space between 2020 and 2022. A range of additional options remains. One possible schema for meeting future requirements is shown in the figure below. This starts with the augmentation of Voëlvlei by 2020 as the best immediate option. The sequence of interventions in this scenario is based on the 2014 Water Use Reference Scenario with successful WC/WDM, and with lower cost options implemented first. 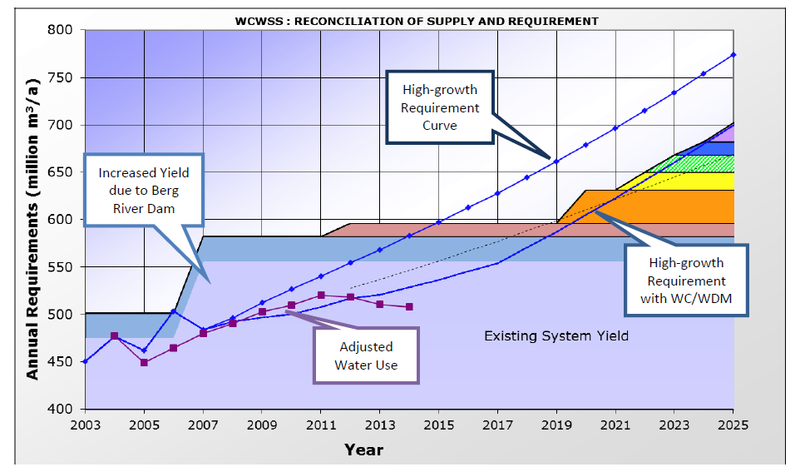 Figure 2: Planning scenario of interventions available to meet Western Cape water requirements to 2040. The interventions used in this particular analysis are shown in the table below. It is important to note that the implementation dates follow almost year-on-year, due to the relatively small yields of the different schemes. Table 1: Prospective interventions to balance water supply with expected increase in requirements (refer also to Strategy Reports). This is only one of a number of possible development sequences. Interventions must take feasibility results, and planning and preparation time, into account. Lengthy lead times are the order of the day for most options. Many possible scenarios are being considered for the WCWSS. Due to its high cost, the desalination of seawater is the last, but not least, of the listed options in this scenario. This, and other implementation dates, would have to be brought forward High-growth Requirement Curve Low-growth Requirement Curve Adjusted and Actual Water Use Desal Re-use TMG Re-use TMG Voëlvlei should climate change begin to impact demonstrably on available yields, should growth be faster than anticipated, or should more water be needed to meet environmental requirements. Alternatively, if growth stalls, implementation dates could be delayed. It is critical that the situation be continuously monitored so that plans can be adjusted and implementation optimised. Water requirements in the Western Cape System are growing rapidly and despite the recent completion of the Berg River Dam, and the successful implementation of WC/WDM, the system might be in deficit in 2020. A number of options have been identified that could supply water for the whole planning horizon. The decision on the first augmentation will have to be made by end 2015. The current recommendation is the implementation of Voëlvlei Phase 1, which can extend sufficiency of supply from 2020 to 2022. Thereafter a number of small schemes can be implemented. Desalination is an option that can be introduced relatively quickly should other supply opportunities fail, but is also the most expensive. The Strategy Steering Committee will keep this strategy up to date and will review and revise its implementation strategy as circumstances dictate.